I've been studying Luke 10:25-37 for about the last six hours. Or possibly my whole life. It's hard to tell - it all runs together. 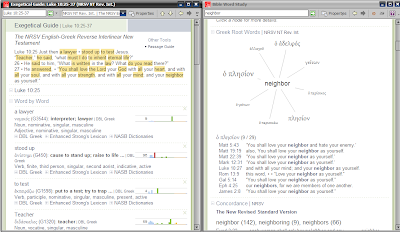 While I'm doing research using five major commentaries and two journal articles, I'm also doing a word study of the word "neighbor." It's key the whole Good Samaritan thing. 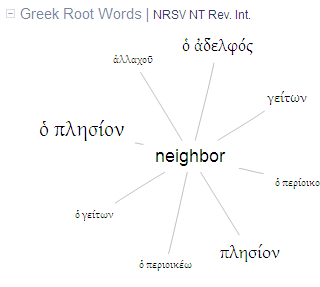 Of course, there were several Hebrew words that mean neighbor... and several Greek ones... yep. Get's a little hazy. Especially at hour 6.5. Total hours of school today: 8am -> 10pm minus 1 hour lunch. Part of this project is due in the morning. But I think I have to sleep instead.